The spectacular site of Ellora is famous for its series of Hindu, Buddhist and Jain cave temples excavated into the rocky façade of a cliff of basalt. The works were done under the patronage of the Kalachuri, the Chalukya and the Rashtrakuta dynasties between the sixth and the ninth centuries. The Hindu cave of Rameshvara, excavated in the late sixth century, is famous for the beauty of its sculptures. This drawing depicts the scene of the marriage of Shiva and Parvati in the presence of the gods carved on the wall of the verandah. 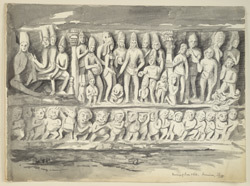 A row of ghanas, dwarf-like creatures is carved beneath the figures.